Trick or Treat? Definitely Trick....Definitely. So my "fun" game on Monday turned out to be something .... different. 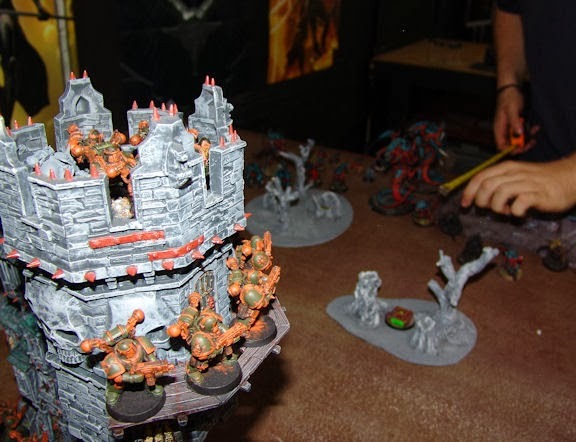 Usually, my throwdowns with my Tyranid nemesis, Broodnest are hard-fought,comical and generally a good time. I had wanted to test out some flyers and continue the tongue in cheek narrative we had going with the Templars of DOOoom and his bacon loving Tyranids. Right after deployment, this particular game was going down a different road. I believe my words were "What the hell is THAT?!?" when I saw the whole army was deployed. I just looked him squarely in the eye and said "There is no way I can make a dent in that and there is no way this is going to be any sort of fun" Too many big critters, buffed by psychic powers to make them nastier, just no way for me to cause enough damage even if I could roll half way decent. My dice DO tend to hit OK, its wounding they seem allergic to.... unless Ms. Blinky is shooting, she seems to have issues hitting, must be that single eye. "Looks scary from up here , Boss!" Actually, the guys in the tower faired pretty well. Their shooting was suprisingly good, though they seldom wounded. They DID cause wounds. But 2 wounds on a 5 wound Trygon.... meh. I took a gamble.. (that was discussed with my opponent.... like I said, we basically played the game as a training ( I DID learn a LOT) and brought Ms Charlotte in against the Warrior unit that was on the objective in the center- an underground cryogenic storage center, loaded with pork products- which she did he whole balefire deal on to some effect, causing wounds,setting one on fire. The gamble was that my Defiler would hang in to close combat with the Flyrant, which it did not and Charlotte was rectally violated by twin linked devourers on the next turn. A rather unexciting showing for her first time out. 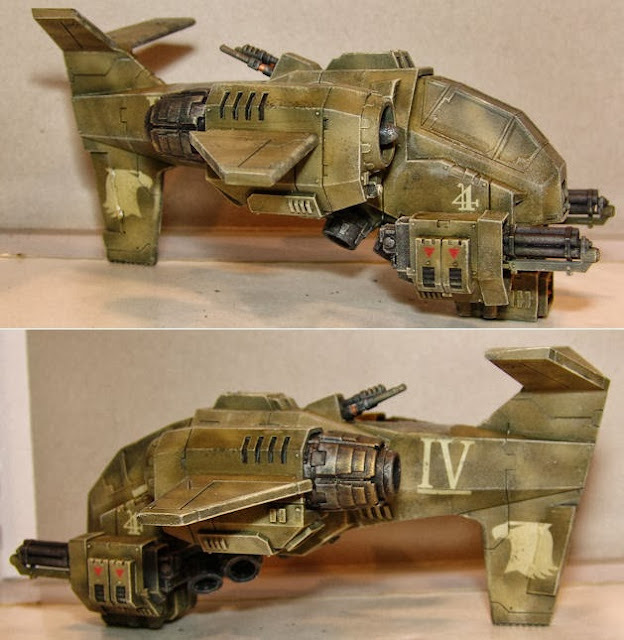 The "Budgie- standing in for a Traitor Vendatta gunship(I NEEEEED to get 1-2 of those)- lazzzed the crap out of one of the Trygons, once again hitting like aces, but failing to wound enough to put it down. Boltgun fire from the tower almost killed the Trygon (again- hit like crazy, failed to wound). It was a scary experience, reminded me of why I don't play tournaments and also of what my armies lack -as in stuff I have yet to purchase. 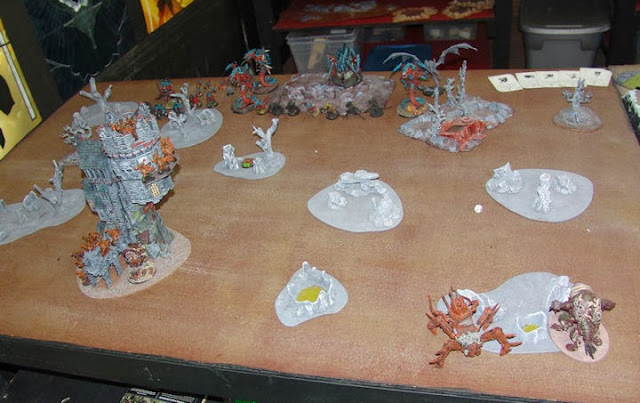 Broodnest, who is a killer player and my painting protege', is going to help me figure out some units and such that will help me against a broader base of opponents, so I can go down to the shop and play. To be honest, I'm not familiar with the local "meta".. and I just build the units I like and think are cool most of the time, so we'll see how it goes. The good news is, I'm actually playing the damned game. Next time (tuesday) he's breaking out his newish Tau army. That should be new for both of us. In other news, I've started the first flight base. I have 3 and each one will be a vignette, likely with gretchin doing something goofy. In this one they will be selling beer. Think Lemonade stand. Last but not least, tomorrow starts a new month. And I've come to a conclusion. I have an aweful lot of troops to paint. Granted, it would have been better to do in October- I could have called it Trooptober or something catchy like that, but instead I'm simply saying that I WILL NOT be painting anything for the next month that is not a TROOP choice. 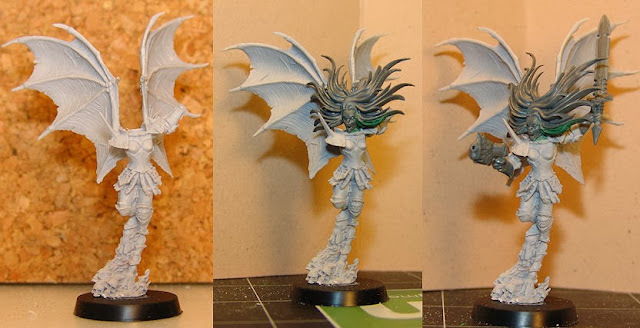 I'll still be working on Charlotte's wings, etc... but I need to build and - most importantly- PAINT- troop units. So expect to see Marines,cultists/guardsmen and some more Marines for the rest of the month. May I present to you, Lord Inquisitor and Protectorate Marshal of the Crius Archipelago, His Grace, Sir Neville Jaxi Baggibottom the Third. I'll admit to being a bit of a dope. One of the reasons for the delay in this post was that I HAD done a step-by-step photo bit on how I did the whites and such on His Grace. But, in a sudden fit of stupidity brought on by sleep deprivation and possibly one too many bottles of Woodchuck Hard Cider (Don't photo edit under the influence.. ) ... I, well.. I actually deleted the raw in progress pictures. SO, when I got out of work today, I retook some pictures of the "finished" Inquisitor. I may add some static grass, but I'm calling him done at this point. Imperial Purple, parchment/warm whites and black are the colors of the Crixus Reclamation Force led by His Grace. He's known as a bit of a "collector"... definitely an eccentric, though saying that too his face is not always recommended. He collects, among other things, Space Marines. 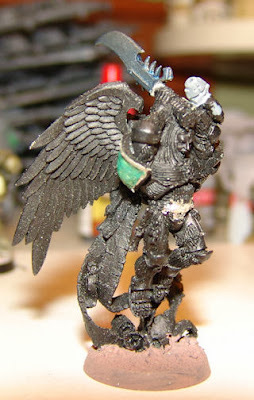 If there is a wayward,decimated Chapter struggling for existance or perhaps with its loyalty being questioned, His Grace might just swoop in and "save" them.... for the price of fighting for him, of course. In the process he collects as much information about the chapter,its lore,etc as he can, before using them up in some dangerous mission. Of particular interest to him are chapters of the 29th or Cursed founding, which he finds particularly fascinating. many have speculated there is some great work underlaying the Inquisitors odd compulsion, others write it off as an unnatural fascination. 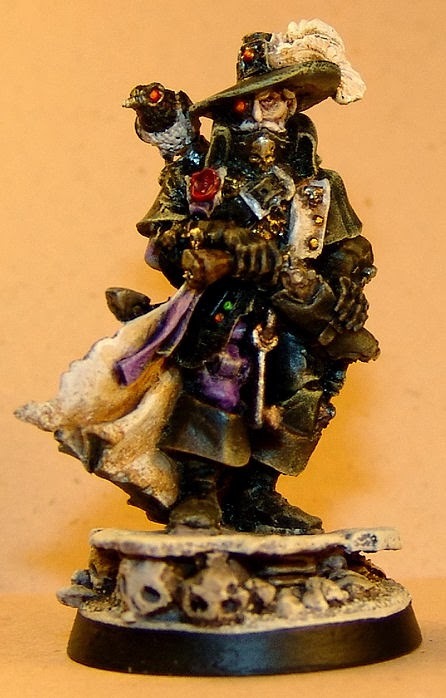 And one of the leaders of their contingent, a Chaplain. Yes.... that is a feather cloak. I finally got my stuff from Poland. Finally, shoulder pads for some of the Dogs of Khorne (I didn't order enough-somehow) and some scaley,serpent loving bunch of Slaanesh worshipping gits will be coming along in the not too distant future as well. The next post, however is likely to be a battle report, since I have a game on Monday. We'll see how badly the Chaos dice Gods abuse me. A night's work, progressing left to right. I noticed about half way through that there were little faces ... or maybe it was sleep deprivation.So, I kind of ran with it a bit. 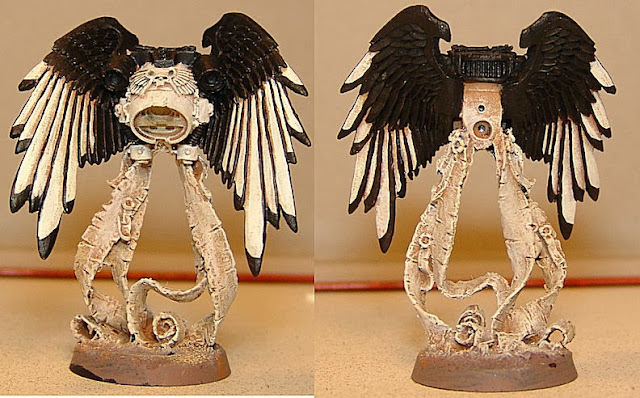 It is a daemon engine afterall, might as well have some tortured souls involved. The first part of my bits order arrived. Yes, you can still find plastic bits someplace. And the prices were reasonable. Overall, very pleased with my interaction with Hoard of Bits. Payment is through paypal and the package came USPS. OH... and looky what I made! AND not to be left out, the Cyber-pie got his new tail. 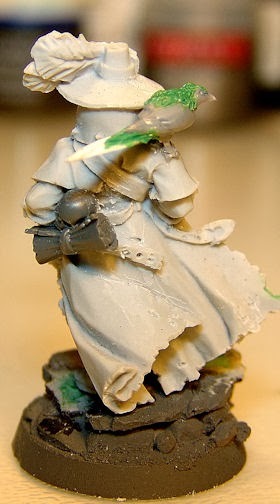 Now the Inquisitor is ready for paint. Once the rest of my parts arrive from Poland, I'll be able to "Bring the NOISE!"... yeah.... there is to be a Slaaneshi contingent for the Templars of DOOooom. With a fairly beautiful camoflage scheme on the 'Budgie, it was time for decals. 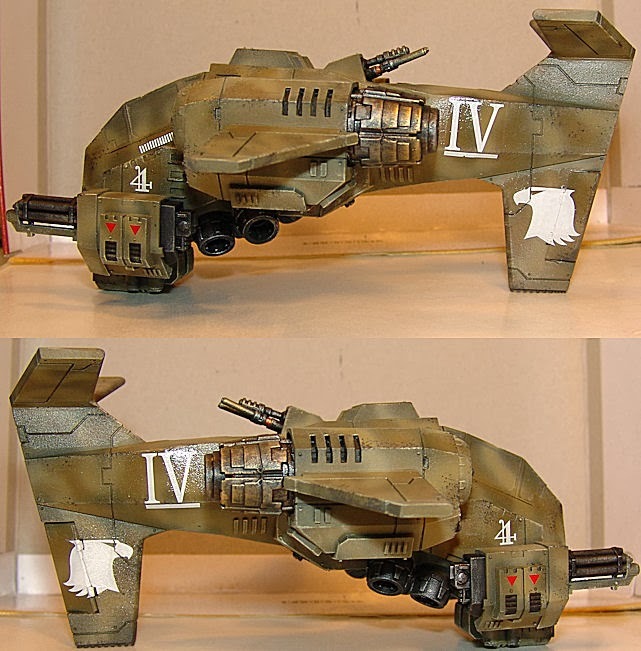 I put gloss medium where I thought I might put decals, then went through the daunting task of going through my decal stash, which dates back about a decade, with Games workshop stuff and various 1/48 scale aircraft decals. 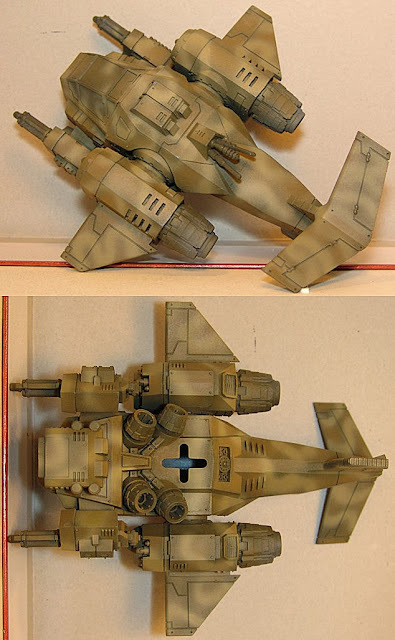 The Raptors symbols from the forgeworld sheet, then some odds and ends from some Me109 and FW190 sheets. Here's what I came up with. I had originally wanted a section that looked like it had been recently repainted or repaired. 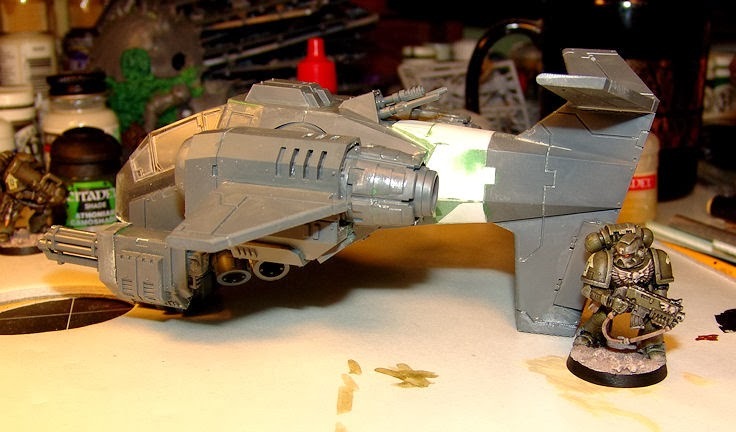 SO... to fix the problem, without having to do a whole repaint of the back end of the model- here was the solution. 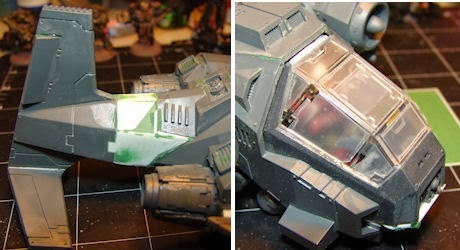 With the "crisis" averted, it was on to the standard Althonian Camoshade wash I usually give my Raptors. Remember that nice camoflage scheme I had, that I worked so hard on...... well, its pretty much gone. 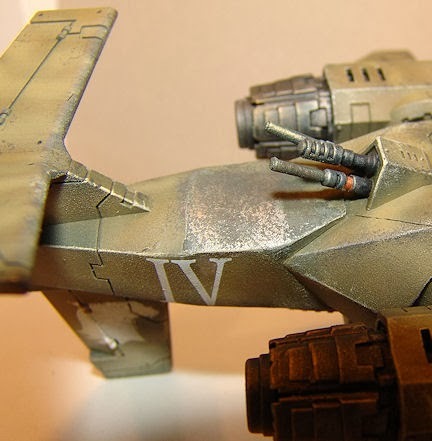 Then a bit of drybrushing, dusting and weathering. Still.... looks pretty friggin sweet. I thought about doing a re-application of the camo color, but I think I'm leaving it the way it is and proceding with the weathering powders and detailing (lights,chipping,etc.). Off came the canopy masks (at least that was flawless) and you can see where it stands below. Finally, shoulder plates inbound for the Dogs of Khorne. 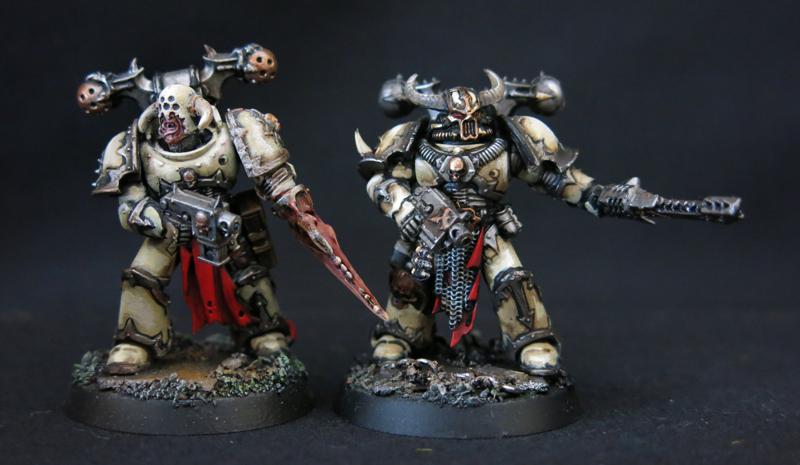 The Khorne contingent will be getting an expansion, with a Raptors team. 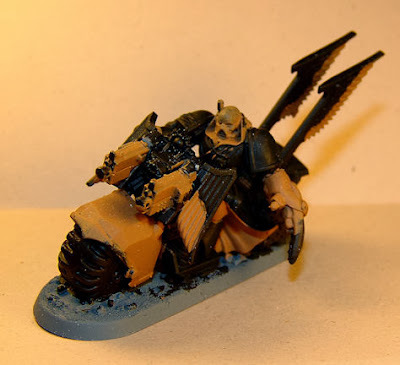 Eventually, there will be some other assorted Khorny units though I have an Eeeeevil idea of building the Khorne contingent so I can use the Space Wolf rules and use it as an Allied contingent for my Traitor Guard. Thunder"wolf" cavalry on Juggernauts? OOooooooo. There is also a Chaos Deamons allied force(which could be played as the primary contingent too) that sits unbuilt, so there is fun to be had there. OH.... and have I mentioned the Slaaneshi contingent? And NO... I haven't forgotten about the girls: Ms. Charlotte and Ms. Blinky. They will be wrapped up sooner than later. Once again, I feel myself drawn back to the Hive Fleets. This time, Hive Fleet "Beautiful Swimmer" or as I call it "Hive Fleet Blue Crab". I have two old metal Carnifexes that will soon be respawned in a rather savory, Blue Crab asthetic. 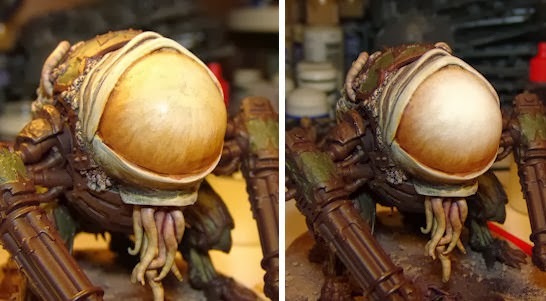 Fred the paint test termagaunt will be making his debut very soon. 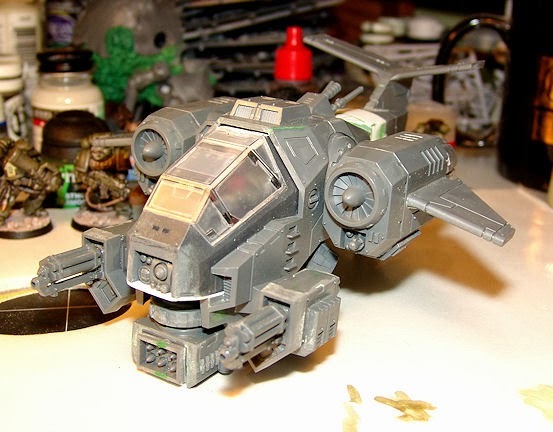 While I'm sure they feel forgotten, I'm planning to finish the Ork Trukk I've been tinkering with. Then I'll finish painting up the Trukk boyz that I started a couple years back to go with it. 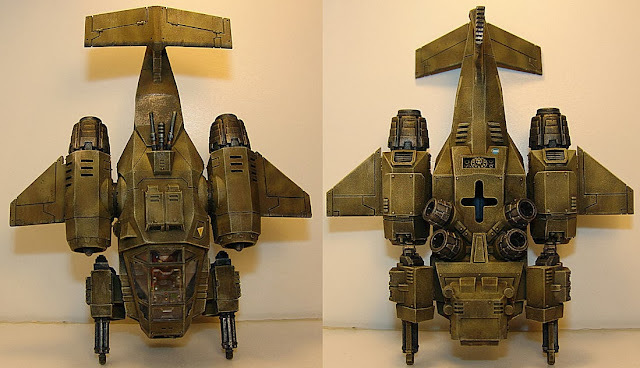 Building and painting the Stormbudgie have given me the urge to build one of my Orky Fightas for air support as well. .... or otherwise entitled "Yet Another Reason I Am Not Fond of Florida". Tonight, I airbrushed the basic paint scheme on the Stormbudgie. Though an old soldier, my nearly 20 year old Iwata airbrush can be tempermental. Not to mention the fundamental problem of airbrushing in the "Sunshine State"- humidity. Somehow, I managed to get through 3 color applications (1 lacquer and 2 acrylic) without and major screw ups. A few minor ones, but nothing major. I probably should have waited for the weather to change tomorrow,when its supposed to be less humid, but this was the best night for a late night for me this week. The results were ... satisfactory. I started with an overall coat of Testors Model Master Green Drab. It went on fairly without incident, only a couple drops of water in the lines, which doesn't bother lacquers much. 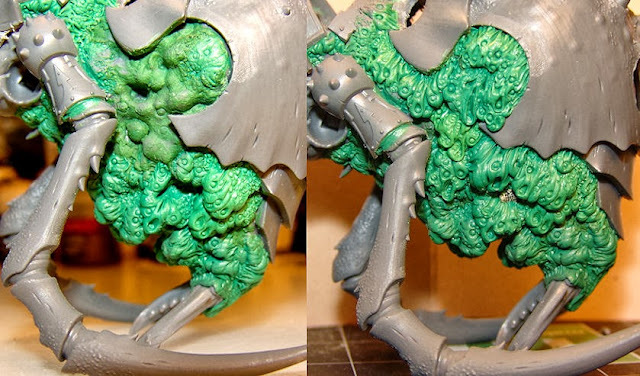 Then I thinned down some Privateer Press Battledress Green which is the base color for my Raptors. 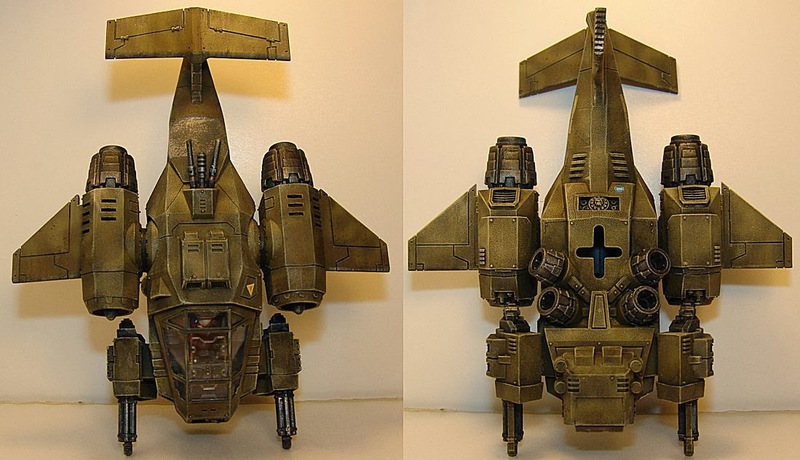 I tried to let the darker Green Drab show through around the panel lines and recesses, to give it an overall worn/faded look. There were a couple water-in-the-line incidents, but easily dealt with and neither left anything noticable on the paint scheme. At this point I really should have snapped a photo. It looked pretty cool. But as usual, I forgot about the camera while painting. The "field applied camo" color was testors Model Master Israeli Armor Sand Grey. Lots of challenges with the humidity since I was trying to do a line pattern, most I was able to blow away by backing off the paint and hitting it with air through the brush. Next will be all the detail painting and weathering. I hope to have her done by next week. Also on the workbench (along with many other things) are some of the Angry Magpies. 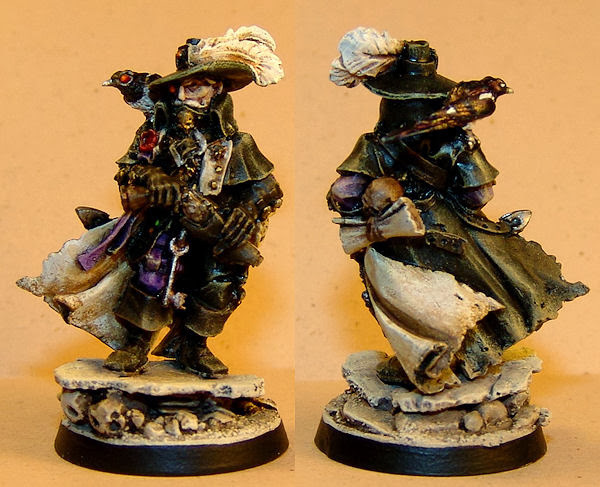 A horrendous dremel mishap, which injured me and the miniature, has made me change course a bit on what the Librarian will look like, but I have laid out the basics of his jump pack. Its not totally done, there will be irridescent blue-black feathers and such, but it gives you a basic idea of colors. I've also repurposed an older conversion of the Dark Vengeance Chaplain for the magpies. 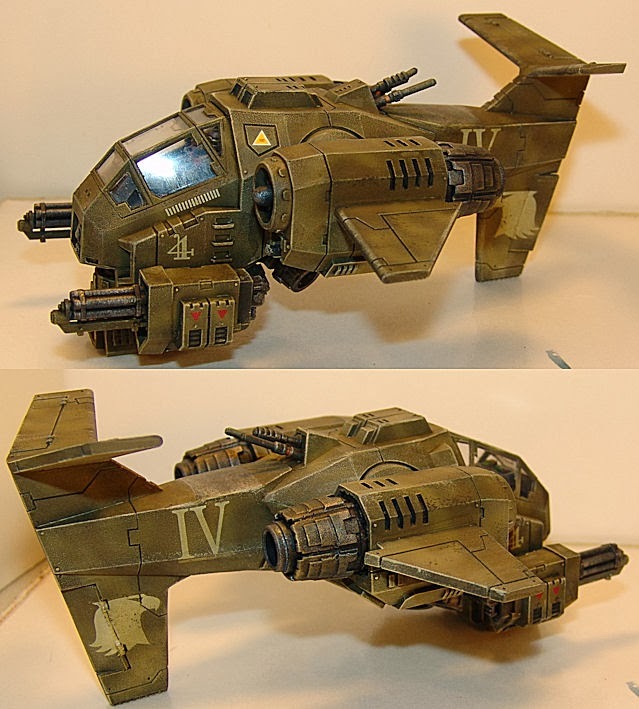 Thanks to some trading of old minis I'm not using, I have 2 Landspeeder Storms on the way. I'm probably going to make one Raptors and one Magpies, but we'll see. 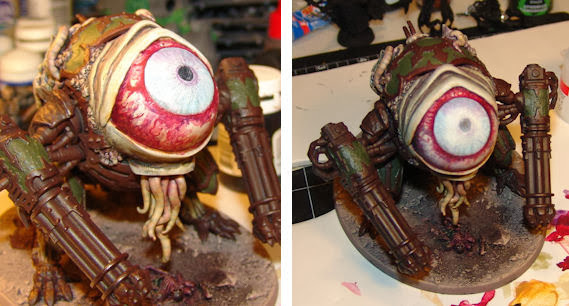 I've had several people ask for some detail shots of Ms. Blinky's eye. So I figured I'd share the montage here as well. 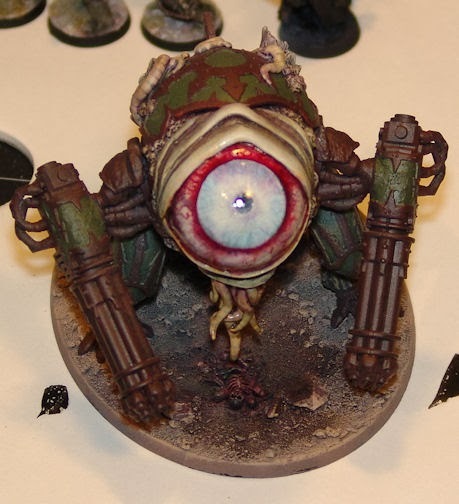 It came out so good, now I'm going to have to put more nasty bloodshot eyes in my Chaos army. Way to raise the bar on myself... dumba$$. More stuff in a day or so. Angry Magpies on the painting table as well as a few other things, plus more work on Charlotte and Blinky. Monday night or Tuesday most likely. From the Workbench: A 'Budgie,an Eye and a Magpie. Then, I masked the canopy with good ol' Scotch tape. I've always used it. I give the canopy a good polishing with a t-shirt, to get rid of fingerprints and such. Make sure my hands are clean and cut away (carefully and lightly) along the framing with an exacto knife. I use toothpicks to rub the tape down along the edges first. 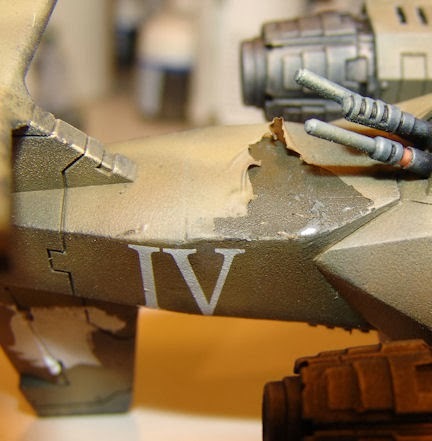 It never seems to life up, even with multiple spraying/layers of paint. I'm not 100% about brush painting , since I usually airbrush my planes. 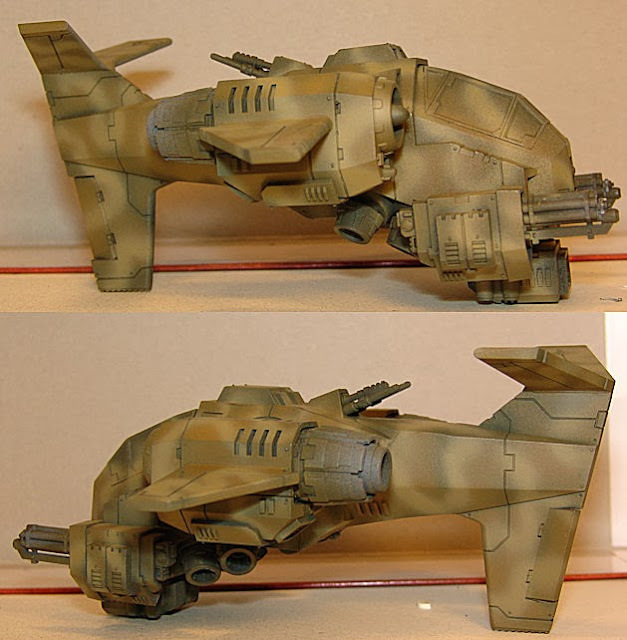 Next was the front end, which needed a bit of fill and sand work as well as final decisions on the armament. 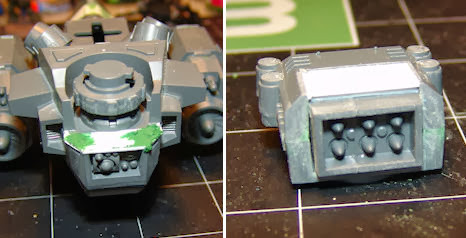 I made a Typhoon missile launcher turret for the nose and decided to mount my assault cannons outboard. And here's the finished 'Budgie... ready for primer. The next subject might be a bit of a suprise. You might think I had forgotten about her. She's been looking a bit lonely lately, so I decided to dust her off and stay up all night to do some fevorish painting. I skipped a few steps here and there with the pictures, because I always forget about the camera when I'm painting, but I'll try to give you the basics. Here I lightened up the base Yellow Oche with bleached bone, then bleached bone and white to give me a brighter area to work on. 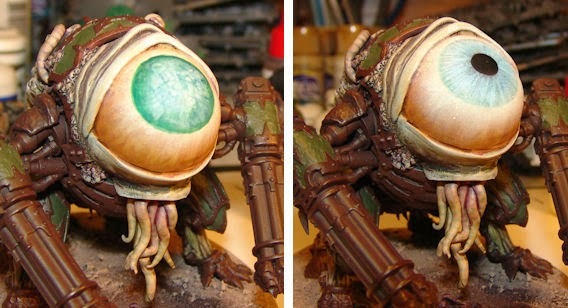 I hit the edges of this with a shade (the yellowy brown Sepia)... then on to the pupil.